Isaiah 29 actually mentions the Book, the unlearned man who receives it, and cave Hira. Let us look at brother Idris' research. May Allah Almighty always be pleased with him. Brother Idris proved with in depth analysis of the Greek that the accurate translation of Isaiah 29:12 is: "the Book will be delivered in Hira to an illiterate man...". Pay attention to the colored and highlighted emphasis below. The following table is Evidence #1. The rest are coming up, insha'Allah. As you will see in the following table, the original word was χιρα . As you know, Muslims for quite a long time has interpreted Isaiah 29:12 as a prefiguration of Prophet Mohammed (SAAW) and specifically his first revelation that took the form of a vision when he slept while being inside the cave called "the cave of Hira" (ghar Hira), since it is located in a mountain called by that name (i.e. Jabal Hira). In regards to Isaiah 29:12, there are some exciting, still undiscussed details that - after expounding them properly - bears a clear testimony of considerable importance which relates to the moment and place where the future mission of Prophet Mohammed (SAAW) would start. I would like to introduce some of these still not known and unexplored details in my posts. Below are some thoughts concerning Isaiah 29:11-12 taken from my up-coming book written originally in Polish under the title: "Znaki i Proroctwa Biblijne: Starotestamentowe Przepowiednie o Mekkańskim Proroku". (2) textual or historical dta which point to an event's original setting and with which the person responsible for displacing the event must have been acquainted. Motivations for the empirically-derived displacements fall into three broad categories: ideological, thematic, and exegetical (For more, see Glatt’s paper thesis under the title Chronological displacement in Biblical and related literature, [Ph.D. thesis], University of Pennsylvania, 1991). Recent scholars got enough proof that the author of the Book of Isaiah (who according to a certain group of scholars was paradoxically not even Isaiah!) have interrupted or modified the original chronological sequence (i.e. the right placement of a particular narrative). It seems that the editor who restructured the original text, picked up various stories and then blended them with others – not always in their chronological order - to create his own background information which would correspond to his theological-political purposes (whatever his belief was). Also, biblical scholars now fully recognize the fact that the text of Isaiah, as well as other Old Testament books (e.g. Leviticus, Numbers, Samuel, Kings, Jeremiah etc. ), were gradually expanded by incorporating into them new materials (See Evidence of Editing: Growth and Change of Texts in the Hebrew Bible, eds. R. Müller, J. Pakkala & Bas ter H. Romeny, Atlanta, GA: Scholars Press, 2014). The tragic thing is that in consequence, most – if not all - prophecies were rewritten over and over again which caused their separation from their proper places. So facing all of this stuff (and I just mentioned only a few), we have no idea what was the original form of the text! That's why scholars today from all around the world are obliged to work so hard to reconstruct at least the earliest form of the biblical text since the original one is lost, and perhaps will never be recovered. I have quoted Stulec’s statement in a response to those self-opinionated Christian and Jewish apologists who think they know without a doubt(?) what was the form of these texts and how they should be interpreted by reading from its context. As far as I know, some Christian apologist cites Mark 7:5-7 as a proof that Isaiah 29:13 is talking about a punishment or judgement against Israelites (however, the widely held view is that these texts are Markan redaction and they are not historically related to Isaiah 29:13). They will be surprised that even their early catholic authorities used these verses in a totally different manner. Moreover, scholars of high-class differed as to when the context begins and where it ends. I will deal later with this apologists argumentation commenting it extensively. Now, let's examine Isaiah 29:11-12 from a Muslim hermeneutical approach. "While Cb3’s main object is to increase the legibility of the text, usually by normalizing the orthography of the original scribe, he possess a certain textual importance as well, for he has frequently erased an addition or substitution by Cb2, and sometimes (but much more rarely) one of Ca. But whether these alterations imply collation with another copy may well be doubted, as the effect in every case is purely negative. So far as our observations go, Cb3 makes practically no positive and original contribution to the text." 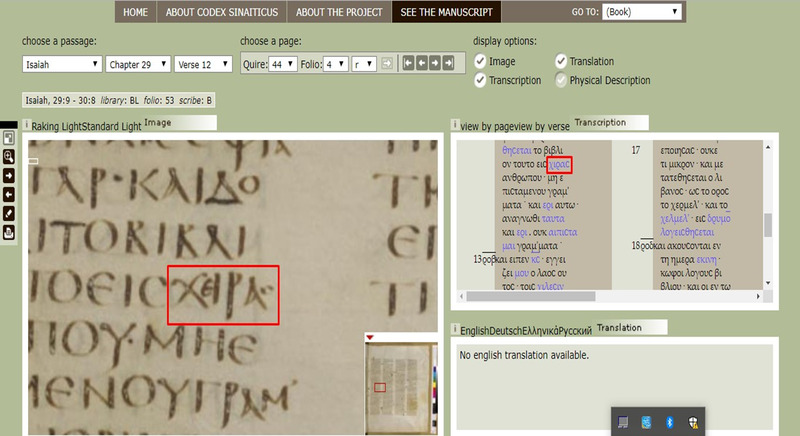 (See H. J. M. Milne & T. C. Skeat, Scribes and Correctors of the Codex Sinaiticus (London: British Museum, 1938, p. 49.). Codex Sinaiticus was originally written in uncial letters, which means that these two letters of minuscule size (i.e. epsilon and sigma) were not part of the uncial script. They were evidently added by the later corrector (Cb3). 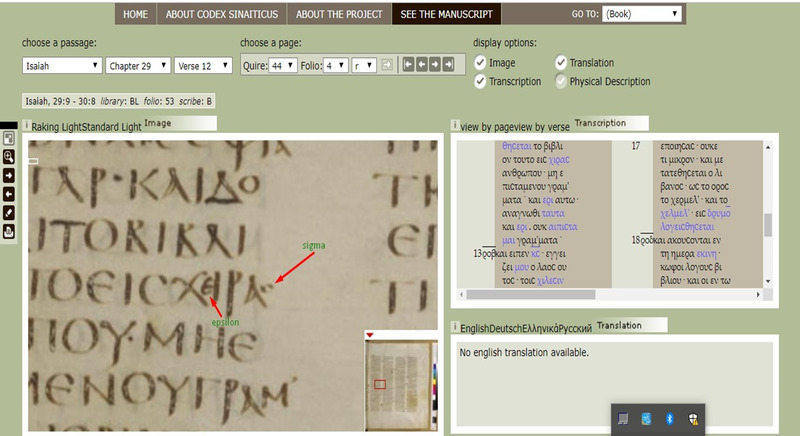 Notice that the electronic transcription of the Greek text, authorized by the editors of the official website of Codex of Sinaiticus, intentionally omits the epsilon, apparently recognizing it as non-original "insertion" (but what about sigma?). My first reflections on that was: what is the nature of this textual intervention? Does this strategical step taken by the anonymous Cb3, consisting in adding the fifth and sixth letter (thus changing the physical-graphic form of the word ! ), suggests a possible attempt to adapt/harmonize the text with later copies and thereby cover up some "uncomfortable" or "unwanted" information that has not been noticed by previous copyists? As Constantin von Tischendorf theorized, the correctors were active during a long period between 400-1200 A.D. (although others have argued that the last changes were made even in the 1800’s!). The Cb3 was most probably active after the times of Prophet Mohammed (SAAW). In my opinion, the word χιρα (chira) aroused some suspicion among the monks from the Monastery of St. Catherine, where Sinaiticus was kept over centuries. However, I think that at the beginning, Christian monks were probably not aware of the meaning of this word. But, sooner or later, members of the Coptic community who lived under the Islamic government, must have heard about the story of al-‘Alaq which occurred to Mohammed (SAAW) in the cave of Hira. When they suddenly realized that Isaiah 29:12 is alluding to that incident, one of them immediately ran to the Codex and intervened: his goal was to alter the meaning of the whole context by manipulating with the text as possible as he could (by introducing an additional letters to χιρα in order to eliminate any alternative interpretation of that word). I have contacted some scholars who work with Greek manuscripts to see what is their opinion on this particular case. Thus, according to one scholar from Germany, at the time when Sinaiticus was copied, the letters ει and ι were supposedly pronounced the same (another fitting example he gives is ε and αι) and so such errors were conditioned phonetically. He pointed also to another example: namely, the common confusion between 'there' and 'their' and 'they're' that many modern English speakers (especially native speakers) are susceptible to. 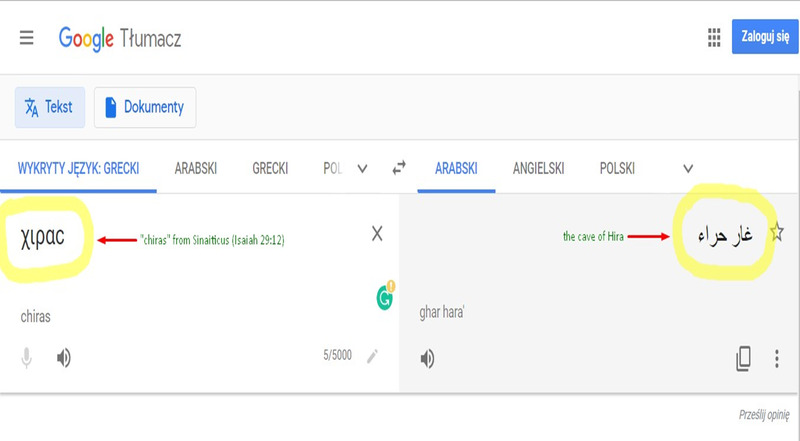 I guess Google’s Arabic translation of χιρα or χιραϲ from the Sinaiticus manuscript, betrays unambiguously what Hira really is! Here is also an article from Greek Wikipedia about the cave of Hira. 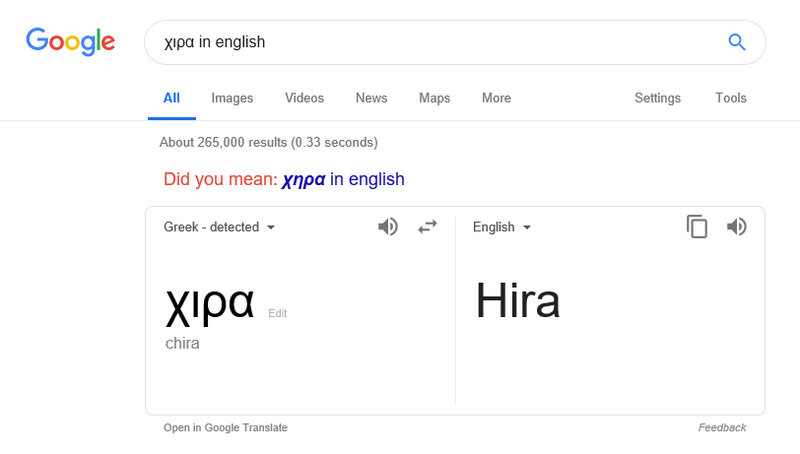 Notice how modern day Greeks spelling it: they are using exactly the same letters for the spelling "Hira" as in Codex Sinaiticus (after we cancel Cb3’s epsilon and sigma): https://el.wikipedia.org/wiki/%CE%A7%CE%B9%CF%81%CE%AC (χιρα from Greek to English Google Translate:     video). The big question: is there any Greek dictionary or lexicon in this planet mentioning it at all?